Back in June we spoke to you about Picksie – which is a recommendation engine with a push mechanism. For us it was really exciting to be back as take part in the launch of Picksie’s 2.0 this past November. tanaRi events’ helped put together a fabulous private event at the Lucky Strike Bowling Lanes. We handled majority of the event design, planning & production, along with day-of-coordination. Picksie made its name as “a New Yorker’s best friend” with its new and much-improved interface, speed, and functionality. And the best part for everyone out there? It’s free. For us, it was great to be part of sharing this product with a discerning audience who love technology and also enjoy exploring the city. The party space was set-up to be modern & very tech savvy. As the brand color is green, the Picksie green was the chosen theme color. The color was brilliantly incorporated into the room and the different elements in the event space. The neon bright kiosks manned by Picksie experts, and the video displays on TV screens demonstrated the various unique features of Picksie 2.0. The launch party began at 7pm and we were excited that the space filled very quickly with techies, and Picksie supporters. As soon as guests entered, there was a red carpet entrance with Picksie 2.0 step & repeat where guests posed for their photos. Few minutes into this, our special celebrity guest, Avril Lavigne arrived with Brody Jenner. After the red carpet photo session, Avril came straight to use Picksie’s all new 2.0 application and had very nice compliments for the special features of the latest version. The food and drinks at the event were a perfect blend to the theme and audience tastes. 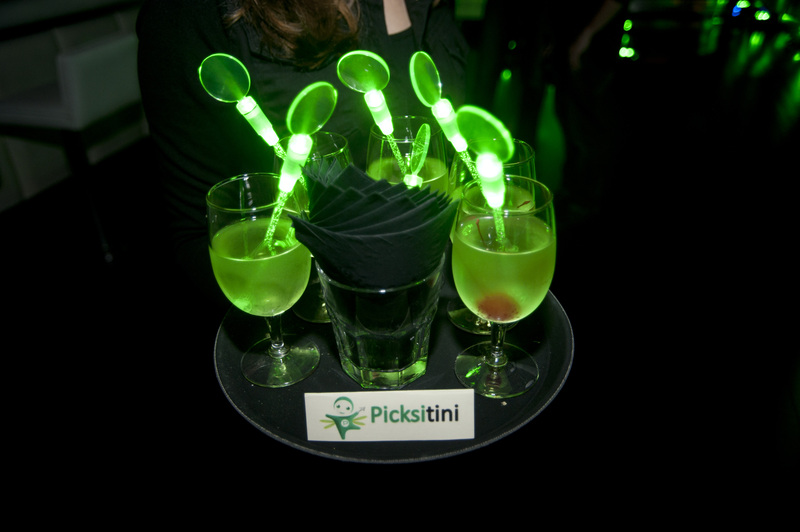 Appetizers were served with green custom made napkins and the drink favorite emerged to be event special “Picksitini.” I personally loved the flashy green swizzle sticks in the drinks that light up and were in the theme color. During a night of drinks, food, music, and fun, attendees were able to test out Picksie 2.0 on iPhones, demonstrated by Picksie team, and learned about the exploring New York City with Picksie’s help. They had a great time meeting Avril and had fun along with her, who bowled a few games with Brody by her side. It was great to see Avril and Brody really enjoying their game. There was a live DJ playing great music and a fabulous emcee who did some stand-up comedy along with the event announcements throughout the evening! Prizes were raffled away to some of the biggest fans of Avril, which included an iPhone 4s and autographed photos by Avril herself! A few other lucky attendees won wonderful prizes to nights out, fine dining, and movies. The guests also received Picksie t-shirts and other memorabilia which were very well received. The planning time was short and, as in most event planning, there were lot of moving parts to the event, but tanaRi events is so glad that everything came together perfectly at the launch. Avril was highly pleased with the event and the product, and every guest left happier and more informed about the Big Apple that we could not have anything more. Thank you to Picksie for allowing us to plan your event and special thanks to all the guests who shared great feedback! Enjoy Picksie 2.0.
tanaRievents · Riri shares her culturally diverse outlook and passion to bring your dream event to life!